The Chevrolet Equinox. You see them everywhere. My mother-in-law has one. This is definitely not a controversial vehicle choice. This week I had the opportunity to test out a new 2012 Equinox front-wheel-drive 2LT. And while I wouldn’t say it stirred me to my very soul, I can certainly see why this medium-small crossover has become so popular. The Equinox is not as cumbersome as a full-sized SUV, it’s more practical than a car, and it does it all in a neat little package that has a fit and finish that rivals luxury SUV’s costing much more. My test vehicle was a color called Mocha Steel Metallic. That’s a great name, but I’d call it light metallic brown. Now that color wouldn’t have been my first choice, and it may have hampered a bit of my initial enthusiasm. But as the week went on, it actually started to grow on me. I nicknamed it “Brown Sugar,” and it actually went pretty well with the “chrome clad” 18-inch aluminum wheels. Plus, the song Brown Sugar by the rolling stones came on the XM satellite radio toward the end of my time with it, which I took as a sign that I gave it the right nickname. 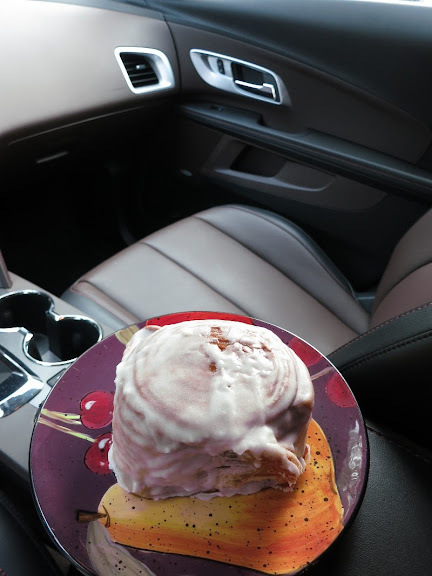 The sparkling brown Equinox was comparable to a fresh, warm cinnamon roll. It was pleasurable, comfortable, and maybe even a bit indulgent. It won’t light you on fire like a breakfast burrito, but it’ll satisfy your needs, and you’ll feel good doing it. 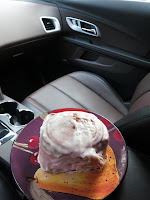 It wasn’t a plain cinnamon roll either. This one came with a large helping of gooey icing in the form of the optional 3.0-liter V6. This is an upgrade over the 2.4-liter Ecotec four-cylinder, and if you know me, you know that I’m always game for a bigger engine and 82 more horsepower. This setup isn’t going to win too many drag races, but it gets the job done. I especially liked it during highway cruising, where it seemed to effortlessly loaf along without calling on frequent downshifts from the six-speed automatic transmission. Gas mileage was decent. The EPA estimates are 17-mpg city, 24-mpg highway. I have a choppy commute with a combination of busy highway and stop-and-go city, and averaged 18.5-mpg for the week, according to the on-board computer. It’s no Prius, but this is a blunt-nosed SUV, not a slippery econo-car. It did drive a lot like a car, though. It handled the bumps in the road without knocking your fillings loose, and it didn’t wear you down after a long drive like some truck-based vehicles can. Aside from the high stance and road-commanding visibility, the only time you really noticed it was a crossover and not a car was when you pushed it hard in the turns. That’s when that higher center of gravity would become evident. I had this Equinox at a very opportune time, because it was just last week that I participated in an extensive ride and drive for Ford’s all-new Escape. A couple of comparisons of these two well-liked SUV’s are inevitable. First of all, from a purely subjective standpoint, I give the appearance edge to the Equinox. Even though it is older and more familiar, I still consider it to be the best looking in its class. This Equinox has been around since 2010, but it still looks fresh to me. I especially like Chevrolet’s front end and grill treatment here. There’s just something about the entire package that I find very appealing. Inside, the Escape has some advantages while the Equinox has others. The Ford is obviously newer, and that translates to being a bit more modern. The gauges and touch screen interfaces are a little more up-to-date, and the ones we drove had more gadgets. I also like the sun visors better in the Ford. Chevrolet’s sun visors haven’t been much to write home about in the past few years on most of their cars. That might not be a big deal, but it’s something that riles my wife up, and she’d be a good customer for this type of vehicle. Why can’t it pull back far enough to cover the entire side window? The seats and door panels in the Equinox are first-rate, though. The tester had a two-tone leather setup in Jet Black and Brownstone. The contrasting stitching along the seat edges and on the door panels was particularly spectacular. Every single person that looked in there was impressed. I’ve seen Lexuses and Cadillacs that didn’t look any better inside. I took the Equinox all over the city. It went with me to the Corvette show. It went to a Cub Scout meeting. It went to church. For everyday family outings, the Equinox was more than capable. I also took a load of people to lunch. Everyone was quite comfortable, even in the back seat. This was especially the case because the rear seat slides back and forth depending on your needs. If you need cargo space, slide it forward. If you need rear seat leg room, slide it back. There’s tons of room back there for any need. I also took it out to Kansas Speedway for the NASCAR Sprint Cup Series practice. It was great in that setting. There was plenty of clearance to take on the bumpy unpaved parking area, and if you had the urge to tailgate, there would be plenty of room for all your gear. It’s almost like the Equinox was specifically made for sporting events. Plus, Chevrolet had a similar-looking Equinox in their track display, so I kind of felt like I was part of the action. Also, the one I drove there would have looked pretty sweet with a big Jeff Gordon-style #24 decal on the door. You may be asking yourself why I would bother to evaluate an everyday crossover vehicle on here. This is primarily a site geared toward enthusiasts and old car lovers. Well, I very much want American car companies to do well. I’ll always root for the home team, and I’m proud when we can lay claim to good cars and trucks. So when I get the opportunity to pass along a little information on a nice vehicle like the Equinox, I’m going to take it. My Equinox tester came in at just under $31,000. For something with this much utility, loaded with a V6, satellite radio, and a backup camera, I’d call it a bargain. My mother-in-law is looking smarter all the time. See Brown Sugar in all its digital glory by checking out the slideshow below. I'm glad you write about things like this sometimes, but I love the car show features too! We own a 2011 Equinox similar to the one in the story, and we really enjoy it! I would recommend the Equinox to beople looking for a similar vehicle!! We sold our 2007 Nitro R/T and purchased a 2011 Equinox 2LT with the EcoTech I4. While the Dodge with its 4.0L 260 hp V6 was a blast to drive, the best Average MPG was 19.2. The average MPG in the Equinox is 26.6 since new! Not to mention the tons of extra leg room due to the FWD. The Equinox with the 4 cyl is no drag racer. I appreciate your input, folks! Thanks for checking this story out!